I use a lot of products every night! 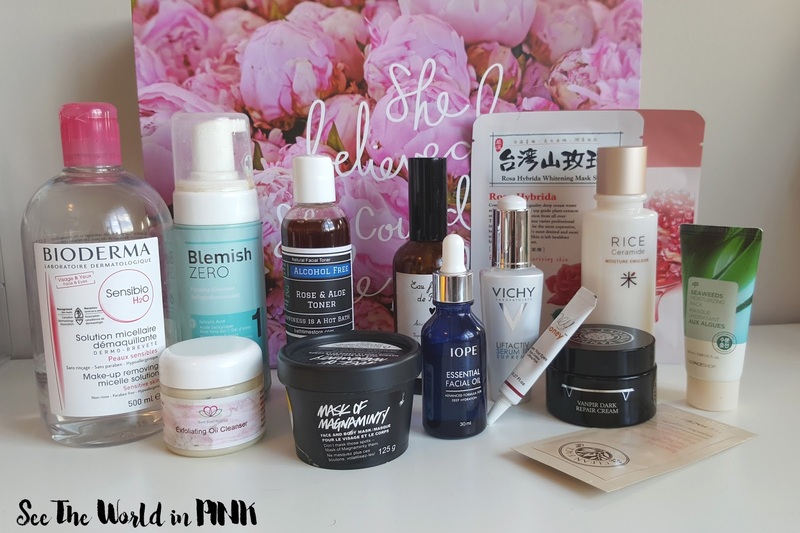 It may seem overwhelming to some - but this is my personal interpretation of the 10-12 step Korean skincare routine. The basic Eastern philosophy on skincare is that you put as much time in to your nighttime routine as you do getting ready in the morning! 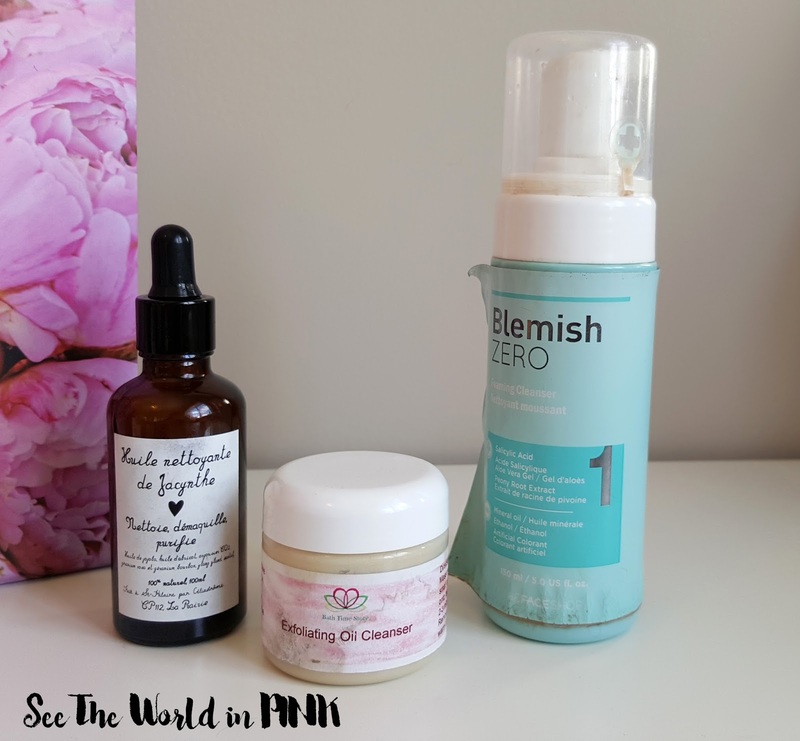 Korean skincare really focuses on putting effort in to your skin with products that are good to your skin (where generally the Western philosophy is to rush through the process). I think it is important to remember that I have dry/combination skin that is also sensitive. So, this routine may not be for everyone but I think that it is important to use the right products and steps for your skin type. Makeup removing is important, especially if you are wearing eyeliner/mascara! My eyes/eyelashes are very sensitive and it has been hard finding something gentle enough to use! This step will ensure that no makeup is left on the face and everything is nice and clean - be sure not to pull or tug at the skin). 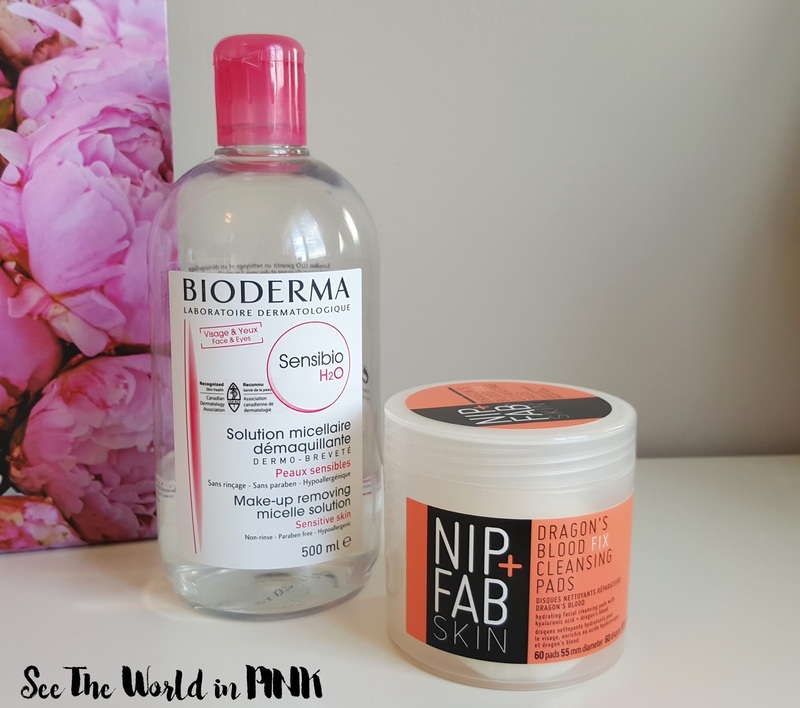 I LOVE this Bioderma Micelle Solution - I use a cotton pad and am very gentle on the eyes! It has become my holy grail product! 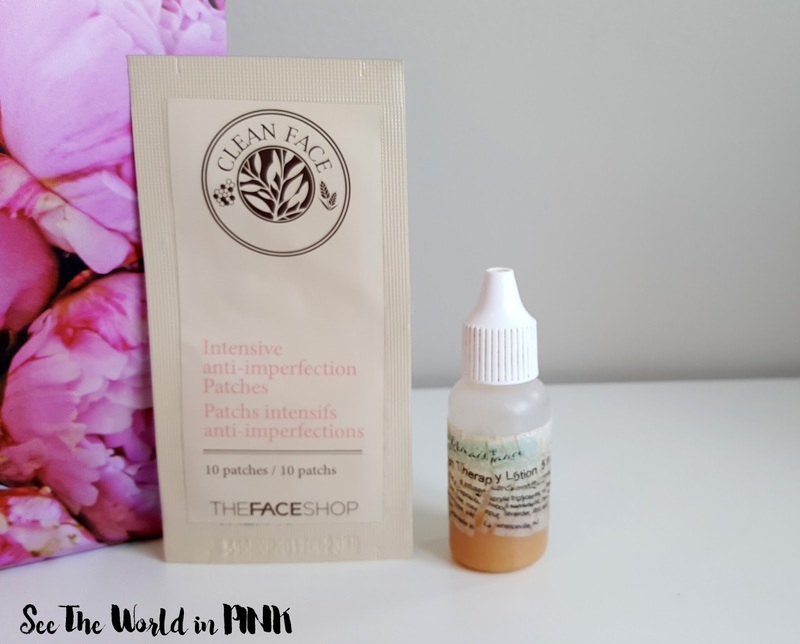 The Nip + Fab cleansing pads are great for a quick wipe over the rest of the face! So this step is a double step! First part is to cleanse with an oil cleanser - put the oil cleanser on a dry face and rub it in, then add water and let it turn in to a milky cleanser and rinse. Follow up the oil cleanser with a foaming cleanser! In this step, I generally use an acne targeting foaming cleanser. These can be drying on the skin, but I follow up with such a thorough routine that it does not dry out my skin! This double cleansing step really ensures that the skin is free of all impurities and is deep cleaned! I love the Bath Time Box oil cleanser and another great one is the Skinfood Black Sugar oil cleanser. My favorite foaming cleanser is the Body Shop Green Tea foaming cleanser. This is not an everyday step! There are varying opinions on how often you should exfoliate and peel your skin. I'm of the opinion that less is more - I only exfoliate/peel once per week! I alternate weekly treatments, so 1 week I will exfoliate and the following week I will use a face peel. You do as much as you are comfortable with or what is good for your skin type! This step is important to help clear off all the dead skin and refresh the skin! I love the Mask of Magnaminty and the other exfoliators here! 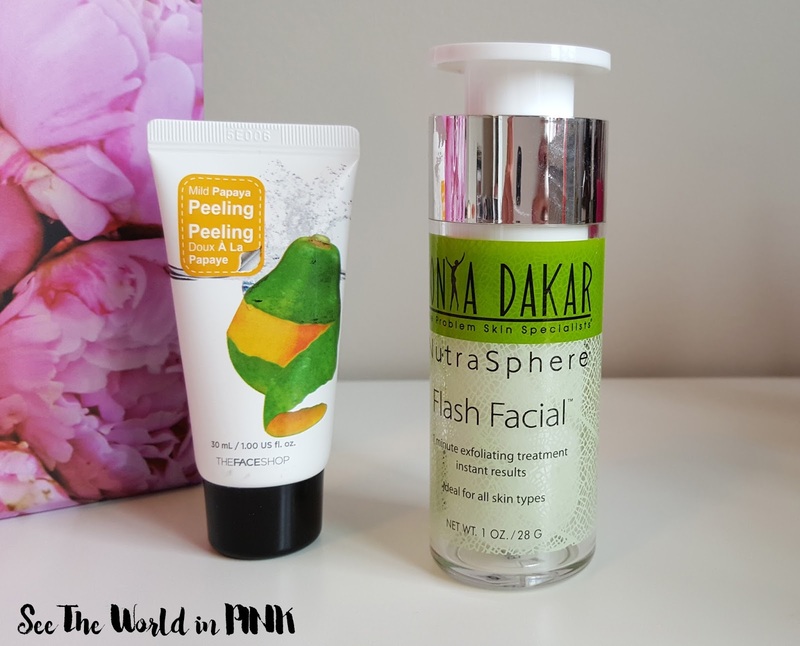 I also love The Face Shop Papaya Face peel. All of these are very gentle and work well on my skin! STEP 4 - Wash Off Mask! 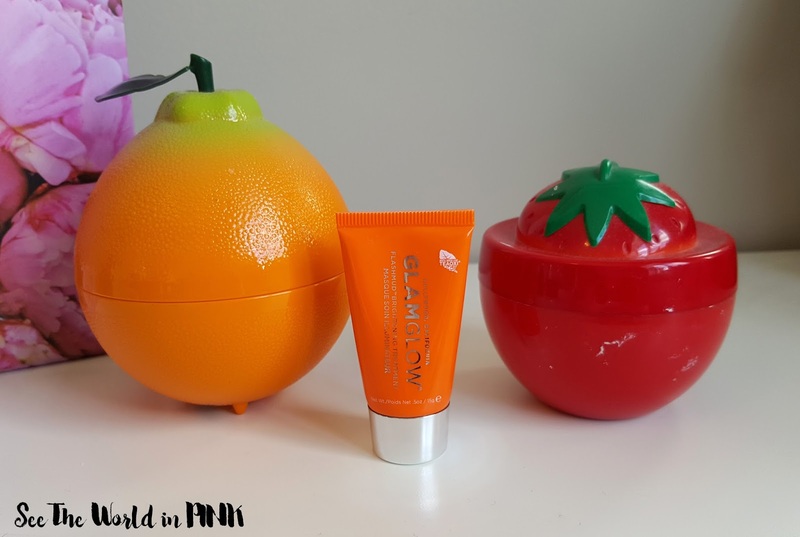 I love The Yeon Jeju mask, Glamglow mask, and Strawberry Baviphat for deep cleaning. 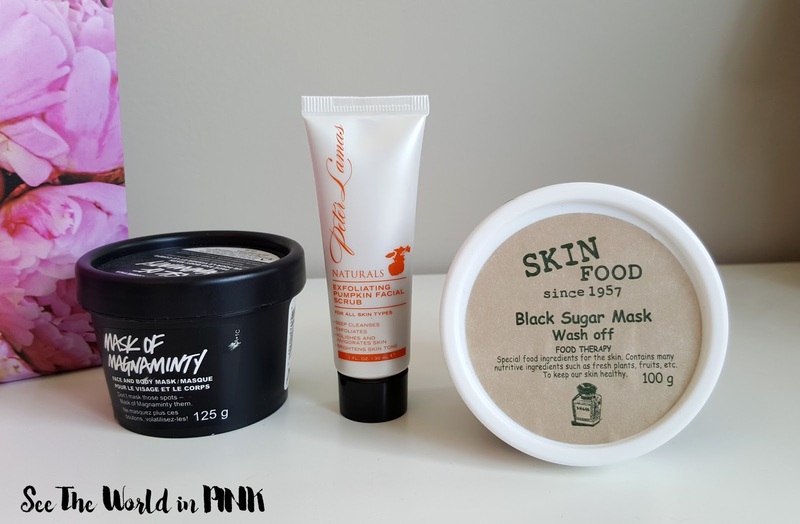 I also love the Juara Turmeric Mask and the Albertini Warming Pumpkin mask! This step is important - toners can also be referred to as a refresher. This step is to restore your skin's ph levels. It is important to look for a toner that does not have alcohol in it so it is gentle on your skin! Don't rub toner in to the skin - make sure you pat it in to the skin! 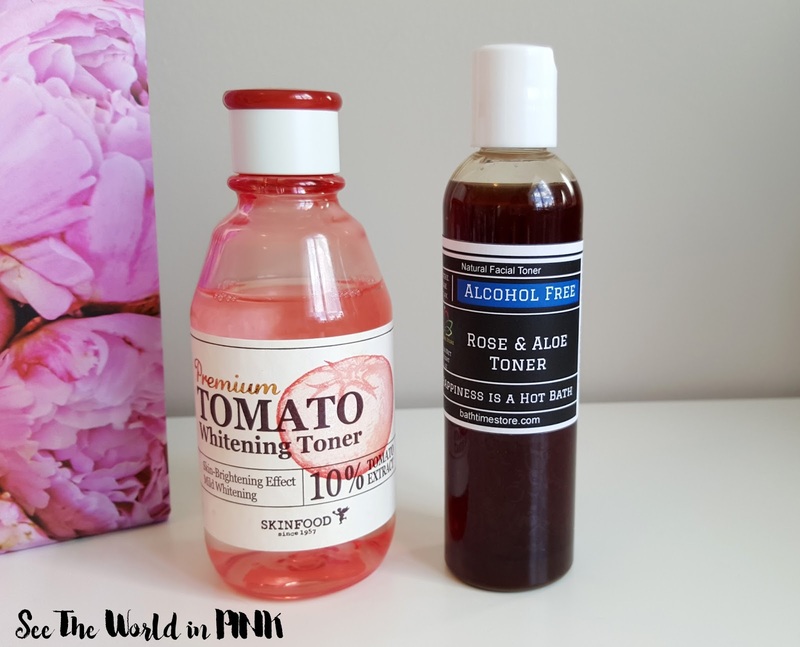 The Bath Time Box Rose and Aloe toner is my holy grail product - this is so good and gentle on my skin! This does not have to be a daily step; but, I try to use sheet masks as many nights as possible! Sheets masks are targeted masks for different skincare needs - but they mainly add a deep level of moisture! The essences in the mask absorb well in to the skin and treat specific needs, such as brightening and soothing. 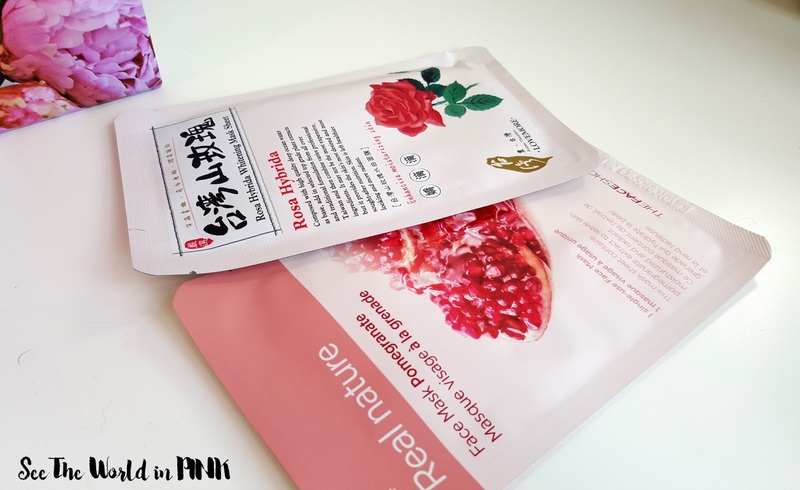 There is a huge range of sheets masks - The Face Shop offers really good affordable masks, or you can splurge on silk sheets masks or have fun with gel sheets masks. I like to mix it up and try new lots of new ones! This step is only on a need-to-do basis! If I have an open/popped pimple, I will use a spot treatment patch on them (the timing is important as this is the best time for the patched to adhere well to the skin!) Or if I just see spot starting or finishing I will use a spot treatment lotion! 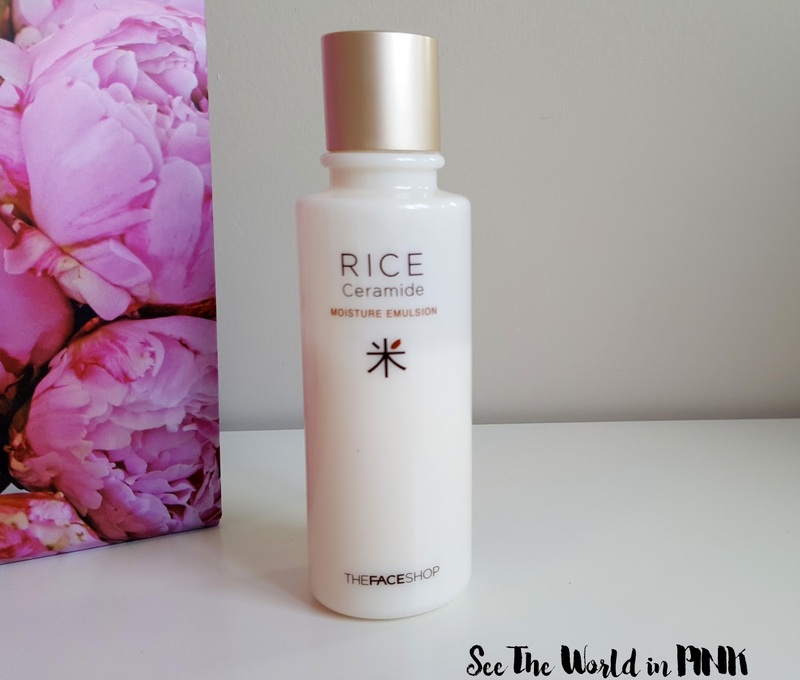 I love using face mists - this step preps the skin to help absorb the serums and add moisture to the skin! Just spray a couple mists on to the skin and allow time to absorb. 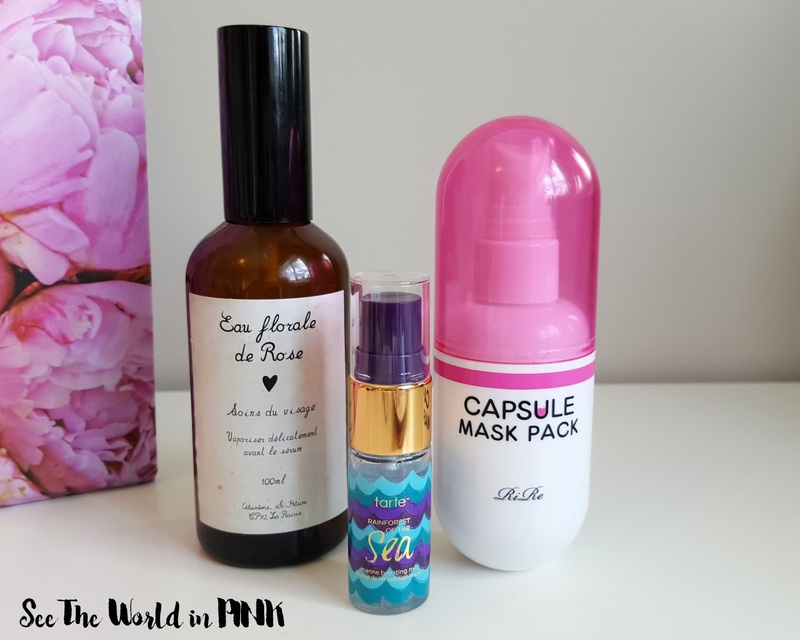 I have loved every mist I have used, but this RiRe Capsule Mask Pack and the Les Soins de Jacynthe Bulgarian Rose Floral Water are both amazing! This also could be considered a 2 part step - Essence followed by Ampoule, but I generally combine them. Essences and Serums come in many forms - but they are made to deliver concentrated amounts of a formula to target specific skincare needs. Some are for added moisture, skin repairing, acne, fine lines, anti-aging etc. I will often use 2 serums an evening to treat my needs. Sometimes I use 1 at a time, and sometimes I will combine more than 1 and apply together! At night I like to use oil-type textures as they take a little longer to absorb in the skin. Again, the application method is important - make sure to pat or tap the serums in to the skin to help it absorb! 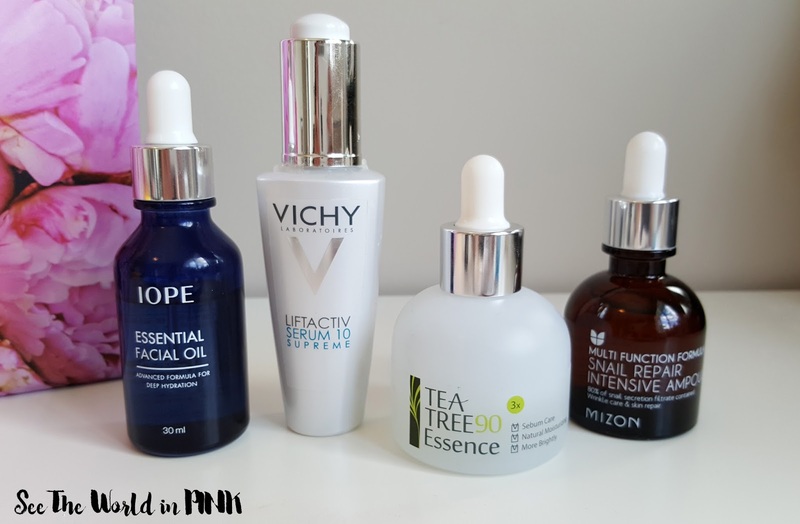 Some of my go-to serums are Iope Essential Facial Oil, Vichy Liftactiv Serum 10, LJH Tea Tree Essence, and Mizon Snail Repair Intensive Ampoule. This step is great for helping for helping fine lines as well as under-eye circles. Eye creams are concentrated formulas so a little usually go a long way! 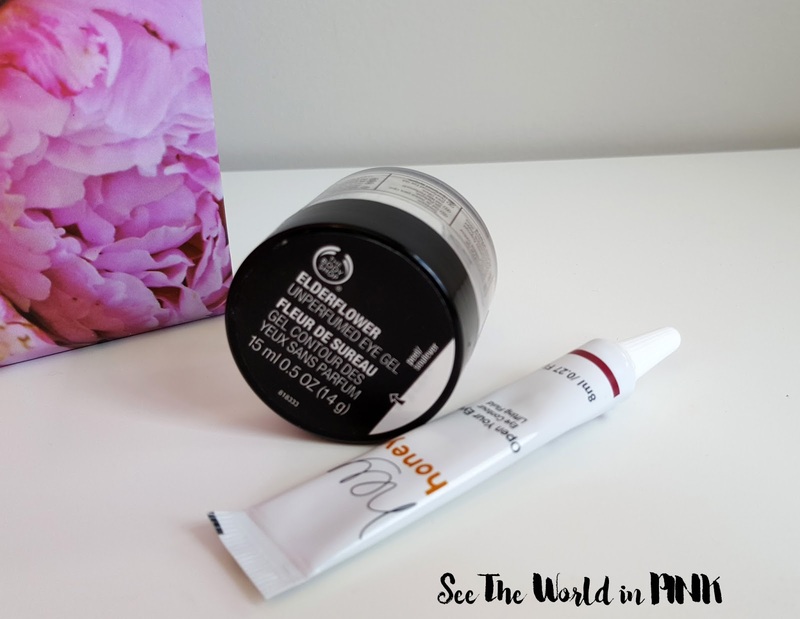 I have yet to find an eye cream that I consider a holy grail product, but both of these are good - again, it is important especially around the eye (because the skin is very thin) not to pull or tug while applying! An emulsion is a pre-moisturizer step - it is basically a very light moisturizer! You may not need 2 moisturizers, but I think this step is great for added moisture, especially before bed! During the night, your skin needs to be hydrated to renew and recharge! This step is straight forward - you pick your favorite lotion to deliver moisture to your skin! I love using a rich moisturizer before bed - night time is when your skin has time to absorb everything and allow all the products to work their magic! This is also a good time to target needs, such as brightening or whitening (don't worry, not skin bleaching just dark spot correcting and skin tone evening. 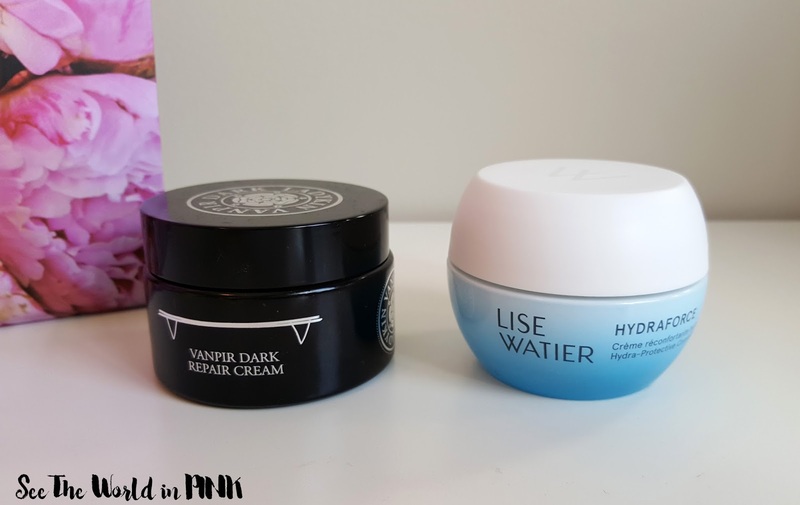 Both the Vanpir Dark Repair Cream and the Lise Watier Hydraforce are my go-to night moisturizers! At this point, you may not think your skin needs any more products on it, but the night cream or night pack is important to act as a barrier to seal the moisture in and allow your skin to breathe. 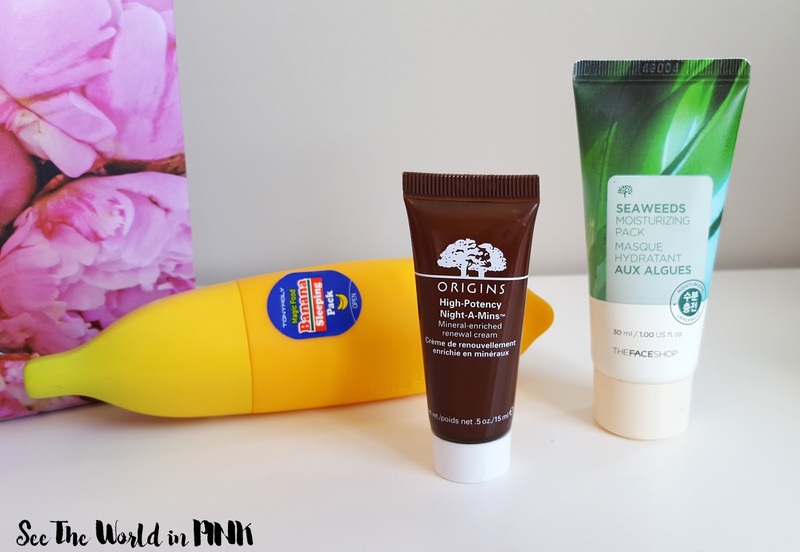 The Tony Moly Banana Sleeping Pack, the Origins High-Potency Night-A-Mins, and The Face Shop Moisturizing Pack are all great! Remember, this is my Night Time Routine so it has a few more steps than my Day Time Routine! My skin has really improved since putting a lot of effort and time in to it! It important to take good care of your skin!